Creating a better place with Brilliant Bikes: Which Brompton handlebar type do I have? It may be simple for those us who have worked on and with Bromptons for years - but many of our Brompton spares and accessories are for specific handlebar types. For the 2017 model Brompton, a new M-type / H-type handlebar was released. It's not so high a rise as the old one, so gives less flex. It also has a less pronounced upward bend in the bars. Lock-on handlebar grips (and how the standard 130mm width meaning that other grips - such as the ever popular Ergon grips) don't need to be cut down for fitting. To accomodate the lower rise of the handlebars and keep the fold / ride position the same, the front stem of the bike has increased slightly in length. The original was the classic M-type, still the most popular with our customers. The S-type handlebars (shown to the right) give a sporty feel to the ride, with your head down ready for racing away from the lights during the rush hour. The P-type handlebars (shown to the left) give the rider a variety of riding positions - hence P-type for multi position. They are generally most popular for long distance touring where, when spending hours in the saddle, being able to ride in different positions can be beneficial. the Northern European markets (Holland, Germany, Denmark and Sweden) where a more upright riding style is preferred. The handlebars used are exactly the same as on the M-type, the difference is that the handlebar stem is approx 2cm / 1 inch longer just below the hinge. Each Brompton handlebar type has it's own handlebar stem and cable lengths - which means you can;t just change handlebar types if you want the fold to function correctly. 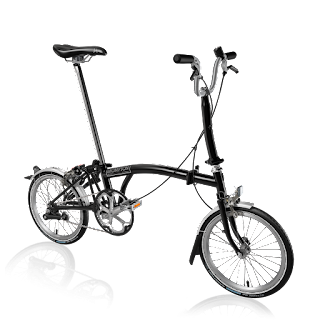 If you are looking to buy a new Brompton - then why not use the Brompton website - it will help guide you through making the right choice (click here) or come and visit Brilliant Bikes in Chobham where we have a large range of Bromptons including a demo in stock - you can see our list of in-stock Bromptons by clicking here.